Most expectant moms would like their pregnancy to be as safe and natural as possible for their infant. Being under the care of a midwife throughout your delivery is especially important for moms looking to get undivided attention with an affordable price. However, it does come with the following advantages and disadvantages. Midwives have been involved in the birthing process since ancient times and have allowed women to give birth naturally. A woman who has enjoyed an uncomplicated pregnancy can benefit from one, and they may find it to be a special bonding experience. Midwives also focus on family participation and pay special attention a woman’s personal preferences and cultural values. Safety is a primary concern of these birthing professionals and studies show that the outcomes are similar to that of a physician delivered birth. While their duties are to oversee both the mother and child throughout the birthing process, you’ll find that medical complications could arise that they aren’t trained for. You should learn about the medical risks as well as rewards to make a thoroughly informed decision. A midwife encourages the mother to actively participate in the process of giving birth by providing emotional support and education. Their calm encouraging presence can also reduce the amount of time a woman goes through labor, and the need to take pain medication. You can also decrease your chances of needing forceps and other medical instruments throughout the birthing process. Women who give birth can also greatly reduce their risk of a cesarean delivery through the help of a midwife. There are several types of midwives, and the certification requirements can vary depending on the type of midwife you hire to help you. A good midwife will also maintain a solid working relationship with a physician in case they encounter any complications or emergencies along the way. Selecting the right person to aid you in giving birth is important and can either help or hinder the process. While using a midwife may seem a more natural and soothing process, it can also come with serious risks and complications. A midwife can be a comfort and true support system to an individual who has had a low-risk pregnancy. 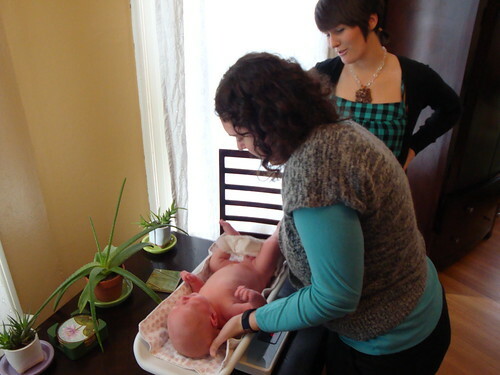 However, there are factors that you need to consider before utilizing the assistance of a midwife. Before you begin the process of selecting a midwife, you need to assess their certification and experience. This will determine their knowledge and level of comfort in handling things beyond their means. You also want to take your age into consideration since both teen moms and women over the age of 35 are considered higher risk. Health complications are other factors that should come into play in your decision making since obesity and diabetes can cause serious risks. Making the birthing process as natural as possible is the primary focus for many new moms and a midwife can aid expectant moms in achieving this goal. However, there are specific pros and cons that must be weighed before you enlist their help to ensure the health and well-being of both mother and child. I am currently pregnant with my first child. My husband and I have talked about the possibility of having a home birth, and we are curious about the benefits of using a midwife. Like you said, one great thing is that a midwife encourages the mother to actively participate in the process of giving birth by providing emotional support and education. Thanks for sharing! I like that this mentioned that a midwife can help reduce the need to use medical instruments in the birthing process. One of my friends is pregnant with her very first child, and has been thinking about hiring a midwife. I’ll share this article with her so she can make an informed decision.